Want to create that special ambience, but can't light candles at your venue? Consider our battery operated LED tea lights. With a realistic flicker and a wide selection of colours, these flameless tea lights are the practical candle alternative that's safe for all venues. Alternatively, you may be interested in our rechargeable candles which have added convenience in hospitality settings. Each single battery facilitates between 30 and 40 hours of light. Tea Light size Battery LED lights (Ivory) each with one button battery ready to go. Button battery gives 30 to 40 hours of light. Tea Light size Battery LED lights (Ivory) each with one button battery ready to go. Where will I use LED Tea Lights? Our LED tea lights are most commonly used in venues which don't allow for open flame. For example, events in in heritage listed buildings typically do not permit the lighting of candles. Health care facilities often have similar rules. In these cases, battery operated tea lights are an excellent alternative to real candlelight. Other venues include those where the weather or other conditions make real candles impractical. For example, on board a cruise ship, or windy outdoor venues. Areas around swimming pools are another popular location - it can be hard to keep a candle lit around enthusiastic swimmers! Of course, you might also choose LED candles simply for ambiance around the home. With no mess to clean up and no risk of burns, electric tea lights are safe and convenient for all settings. They really are the next best thing to real candles! Are your electric tea lights realistic? Cheap battery candles can look very unpleasant, with either a static light or a "flicker" that just feels wrong. Some are too intense, creating more of a flashing light than a flickering glow. Others are too steady and predictable, making them lifeless. These LED candles quickly become distracting and irritating - and we think that's simply unacceptable. At Cool Candles, we provide quality battery operated tea lights with an lifelike flicker effect, as close as possible to real candles. To enhance the effect, pair them with the perfect table lamp so the soft light gets all the focus. We're confident that our battery tea lights are great for creating a beautiful, candle-like ambiance. Are battery tea lights bad for the environment? 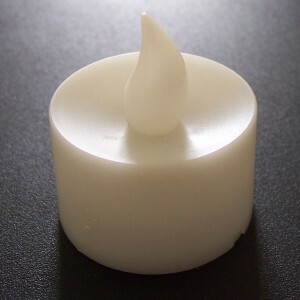 If you find disposable batteries wasteful, you might prefer our professional battery votive candlesprofessional LED tea light sets, which feature internal rechargeable batteries. There's no need to throw out and replace batteries - just return the candles to the charging station! With candles you can re-use for years, you'll avoid throwing out plenty of batteries, used wax and packaging. Over their lifetime, you may well find that battery operated LED candles generate less waste than traditional wax. Do you have coloured LED tea lights? 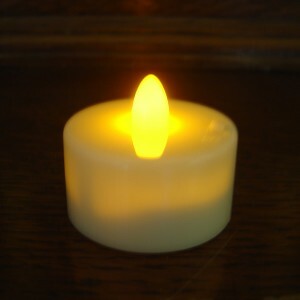 All of our battery tea lights offer a "candlelight" colour - a warm tinted light close to real candle flame. However, one of the best features of LED candles is the chance to get creative with colours! If you need to bring a little extra life to your venue, take a look at our professional battery votive candles. These rechargeable LED candles are available in seven base colours, ranging from natural candlelight, to bright blue-white, to intense blue or green. Pair them with a clear/frosted lamp to control the colour completely, or mix with coloured lamps for maximum impact.